Carlos Ghosn, pictured at the Paris auto show in October, is believed by Nissan to have under-reported his income over multiple years and misused corporate assets. YOKOHAMA, Japan – Nissan Motor Co. is preparing to fire Chairman Carlos Ghosn -- also the head of the globally powerful Renault-Nissan-Mitsubishi Alliance -- for allegedly under-reporting his income and using corporate assets for personal use, the company said Monday. 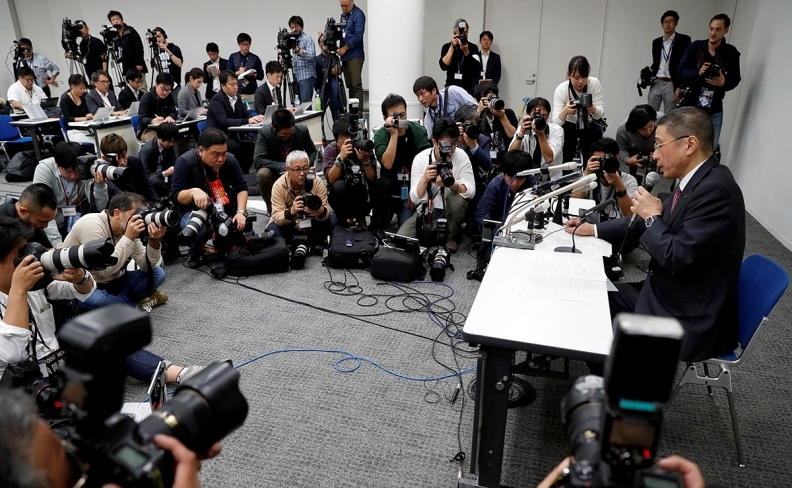 Nissan CEO Hiroto Saikawa, 65, at a press conference here said the board will meet Thursday to discuss Ghosn's dismissal. The company also is planning to terminate fellow board member Greg Kelly, 62, who rose through the executive ranks as a director of human resources. Ghosn, 64, is believed by Nissan to have under-reported his income over multiple years and misused corporate assets. Kelly was “deeply involved” in the scheme, spokesman Nicholas Maxfield said. Saikawa said Nissan was informed by authorities that Ghosn and Kelly have been arrested. Ghosn voluntarily went with Tokyo prosecutors, the Asahi newspaper reported. “We have confirmed these two are the masterminds,” Saikawa said of Ghosn and Kelly. Saikawa blamed the alleged abuse on the concentration of too much power in one top executive for so many years. “This is a negative impact of the long regime of Mr. Ghosn,” Saikawa said. “This is a good opportunity to revise the way we work." He added: “This is an act that cannot be tolerated." Saikawa said he would organize a committee led by outside, independent board members to root out the causes of the wrongdoing and prevent recurrences. They will work with alliance partners Mitsubishi and Renault, when necessary. Saikawa said this discovery adds impetus to the need for reforming the management structure linking Renault, Nissan and Mitsubishi. In the future, it is important to avoid concentrating too much power in one person, he said. Instead, a sustainable system is needed, he said. Mitsubishi Motors Corp., in a late statement, said its board would take action following the reports of alleged misconduct. "It is to be proposed to the Board of Directors to promptly remove Ghosn from his position as MMC’s Chairman of the Board and Representative Director," the statement said. "We will readily conduct an internal investigation on whether Ghosn has been engaged in the misconduct like the above within MMC. "MMC deeply apologizes for any concern caused by the recent event." During the press conference, Saikawa alleged three wrongdoings by Ghosn. He alleged under-reported his income in official stock market filings. He diverted corporate investment funds for personal use. And he misused company expenses. Saikawa called Ghosn and Kelly the “masterminds” of the scheme. “We have to make sure we minimize the impact on business partners and employees,” Saikawa said. While Nissan did not immediately comment on the magnitude of the alleged income under-reporting, the Jiji news agency said Ghosn under-reported nearly 10 billion yen (US$88.7 million) in compensation as nearly 5 billion yen. The Kyodo news agency said it took place over five years, from 2011 to the present. A representative for the Tokyo prosecutors’ office said it doesn’t comment on individual cases. Under Japanese law, prosecutors need to make official charges before a case can be brought to court. So Ghosn’s arrest doesn’t mean he will be found guilty. It’s unclear where he is now and how long the legal process will take. Renault, in a statement from its lead independent director and committee chairs, acknowledged Nissan's statement, but didn't announce any immediate action regarding Ghosn. "Pending provision of precise information from Carlos Ghosn, Chairman and Chief Executive Officer of Renault, the above directors wish to express their dedication to the defense of Renault’s interest in the Alliance," the statement said. "The Board of Directors of Renault will be convened very shortly." French President Emmanuel Macron, whose country holds 15 per cent of Renault Group shares, said: “The government, as a shareholder, remains extremely vigilant about the stability of the alliance." Macron and Ghosn have a contentious history; as finance minister under former president Francois Hollande, Macron had criticized the Renault CEO’s salary as excessive and pushed the state to increase its share in the automaker to the 20 per cent level in 2015 from the previous 15 per cent. A spokesman for France’s finance ministry also declined to comment on the news. Ghosn has been contemplating his next career step as the companies look to change the pact’s structure, possibly through a merger. Ghosn gave up his role as CEO of Nissan last year and has said that he may step down as CEO of Renault before his four-year term ends in 2022, fueling speculation the alliance could lose its architect and main leader for the past two decades. The carmakers have given themselves two years to decide on a possible merger between them or find an alternative mechanism to enhance their partnership, Bloomberg News reported in July. Ghosn said in September that the companies will “clarify everything” within the first half of his current term as Renault CEO. “I am abandoning some jobs to delegate more, the more I consider the organizations are mature and capable to sustain by themselves with the new leadership,” Ghosn said in late September. CEO Hiroto Saikawa meeting with the press in Japan: "This is a negative impact of the long regime of Mr. Ghosn. This is a good opportunity to revise the way we work." Ghosn, one of Japan’s highest-paid executives, is joint chairman of the Renault-Nissan-Mitsubishi alliance and one of the industry’s most storied leaders. This marks a stunning fall from grace for the man who pioneered Nissan’s comeback and has been credited for leading one of the auto industry’s few successful automotive partnerships, the long-running tie-up between Nissan and France’s Renault. Ghosn expanded the alliance to include Mitsubishi in 2016, by engineering Nissan’s purchase of a controlling stake in the smaller Japanese rival. Nissan did not say who would replace Ghosn as chairman nor when the board of directors would decide to remove him. Nissan was expected to hold a news conference about the allegations later Monday at its global headquarters in Yokohama, just south of Tokyo. The news also casts a shadow over the future of the Renault-Nissan-Mitsubishi alliance. 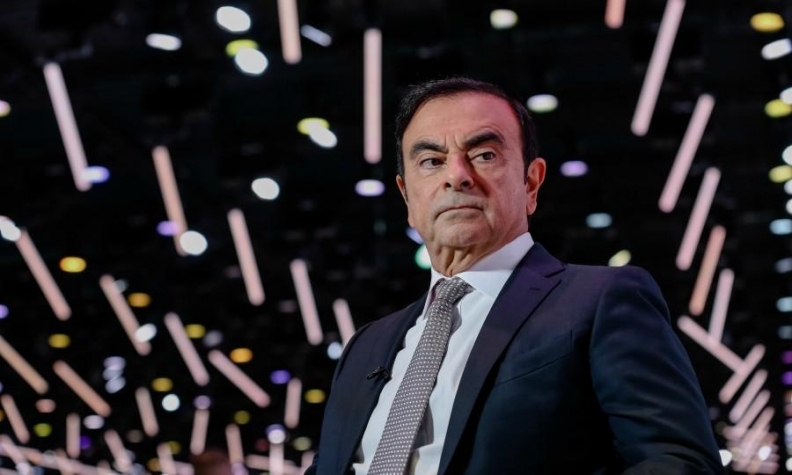 Ghosn had been expected to step down as chairman of the alliance in the coming years, and he has been working behind the scenes to formulate a structure that will keep the carmakers working together while preserving their independence and brand identity. In Japan, Ghosn has been a controversial figure for his outsized salary, routinely the top among this nation’s auto executives. Nissan, as a whole, argues it needs to pay its executives more than the Japanese average to attract top-tier global talent in an international industry. Nissan reported in securities filings that it paid him about 1.1 billion yen ($10 million) for 2016 and about $6.5 million in the most recent fiscal year. He reportedly took home about $8.5 million at Renault and about $2 million from Mitsubishi in the latest period. At Renault, his package for 2017 was narrowly passed by Renault shareholders, but only after he agreed to a 20 percent reduction. Ghosn was sent by Renault in 1999 to take over a then flailing Nissan as COO. He became Nissan president the following year and was CEO from June 2001. He became co-current president of Renault in 2005 and chairman of Mitsubishi Motors in 2016. He relinquished his CEO title at Nissan last year. Saikawa joined Nissan in 1977 and was its chief competitive officer from 2013 to 2016. He previously had roles as the chairman of the Management Committees of the Americas and Europe, as well as the executive vice president of purchasing.